When I started really following Yankee baseball I was six-years-old. Back then, I thought guys like Mickey Mantle, Roger Maris, Yogi, Moose Skowren, Bobby Richardson, and Whitey Ford played forever. I soon realized that wasn’t true. I’m now watching my fourth generation of Yankee legends reach their twilight years. Among them is Jorge Posada. He turns 41 years-old today. Hall of Famer, Bill Dickey caught the most games in a Yankee uniform, with 1,709. The great Yogi Berra caught 1,692. 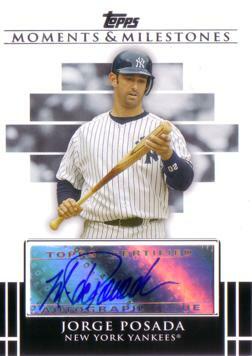 By the end of the 2010 season Posada had caught 1,573 games in pinstripes. Jorge payed attention to numbers and stats and I’m sure that when he signed his last Yankee contract, he thought that by the end of that deal, which was 2011, he’d be setting the record for most games caught in a Yankee uniform. He probably also thought when he signed that last contract that he’d have a real good shot at reaching both the 300 home run (he finished with 275) and 2,000 hit (1664) milestones by 2011 as well. None of that happened. Instead, what was supposed to be the crowning season of Posada’s outstanding career as a Yankee turned into a season of trial and tribulation. It began with Brian Cashman telling him in spring training that he would never again be behind the plate in a Yankee game. I found myself painfully admitting that Jorge’s catching skills were worse than ever. So many pitches got by him. His throws to second were not nearly as hard and accurate as they once were and after 16 seasons of squatting behind home plate, his base-running had gone from bad to scary awful. So I did not disagree with the decision to make Jorge a full-time DH. That didn’t work out as planned either. Posada seemed to have forgotten how to hit right-handed in 2011. To make matters worse, he has was twice demoted by Yankee Manager Joe Girardi prior to nationally televised games versus the hated Red Sox, once to ninth in the batting order and then to a seat on the Yankee bench. One thing many fans and sportswriters seem to forget is that professional athletes don’t perform well because of talent alone. The reason they are the very best at what they do is that they believe they can do it. When Posada walked to the plate to face a left-hander, he never once was telling himself he had no chance to hit the guy. He honestly believed in his head that he could hit anybody at anytime, so when his GM or his Manager told him he couldn’t do something anymore, he didn’t believe it for a second. Not because he was stubborn or in denial but because he had to believe it to have any chance at being successful. And in a memorable August 13th game against Tampa last year when he drove in six runs, Posada got an opportunity to show Cashman, Girardi and a national television audience that although the end of his career may have been near, it wasn’t over yet. And no true Yankee fan will forget his 6 for 14 hitting performance and .579 OBP against Detroit in last year’s ALDS. It turned out to be a fitting curtain call for a true Yankee warrior. Yankee fans won’t see the likes of Posada ever again. Solid switch-hitting catchers who are among the top two or three best in the league at their position for about a dozen straight seasons are pretty hard if not impossible to come by. Throw in five World Series rings and an equal number of All Star game selections and Silver Slugger awards plus all the good things he did off the field and you realize what a pleasure it was to have this man catch for your favorite baseball team all that time. Hip-Hip-Happy Birthday Jorge! Posada shares his birthday with this former Yankee reliever and this former Yankee DH.